We all knew we were going to have to deal with Alexandria Ocasio-Cortezs nonsense. Anyone who won that primary against incumbent and soon-to-be-former Congressman Joe Crowley was going to win. The district is more left wing than Lenin. Its easy to poke fun of Ocasio-Cortez, who found herself in the spotlight thanks to that upset win. Shes a democratic socialist, with many of her colleagues viewing her as the future of the party. And by future, do they mean being the permanent minority party on the Hill? Only kidding. I hate those terms like permanent political majority (or minority). Public opinion can shock usHillary Clinton know this all too well. Still, we have some folks on the Right who are trashing her for her every word. Yes, its easy, but comments about her attire during orientation prior to Thanksgiving were atrocious. Its cheap. Its not effective. It makes her a sympathetic figure. It was overreach. the presidency, the House, and the Senate. Im fine being called a bull in a china shop, because politics that answers to special interests more than the American people *should* be disrupted. Good. Thats how they should feel. THIS is why we drag Alexandria, folks. Its not her clothes or her style or even how ridiculous her tweets can be (and TRUST US, they are ridiculous), but its the idea that anyone is afraid of her or that shes somehow more powerful than she is. Wed just like her to know what the heck shes talking about before pretending shes an expert. And maybe she should take a look at her thread because its not Trump supporters who are actually clutching any pearls, its Democrats who are concerned she will destroy their party with her divisive blathering. Batshit crazy and uglier than a horse. Only 8 of every 200 eligible voters went to the polls on Primary Election Day and voted for this imbecile! Say what you will, in a blink of the eye she’ll be a member of congress from an important part of an important state and she’ll soon have committee chairmanships and memberships. Her vote will count as much as Nancy Pelosi’s, Duncan Hunter’s or Steve King’s does. If the Democrats were smart they’d assimilate her early. 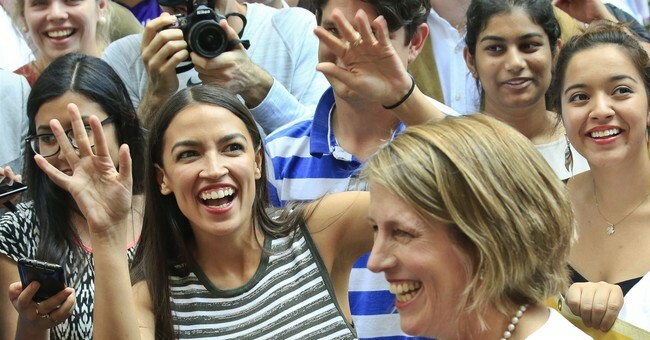 Had the Republicans organized even a little, to create a shadow, write in vote, and they won, imagine the hilarity.
. Shes a democratic socialist, with many of her colleagues viewing her as the future of the party. 1. democratic socialist Is this CODE for Communist or NAZI? 2. How Stupid does the Author - Matt Vespa - of this article think we are? Is P.C. at that point in time where "journalists" are terrified of their own shadows? Did you say uglier than a horse? Yeah. You got that right. If you were to list the top three criteria for a Democrat congress-person, “smart” would not make the cut. And she’s got all three boxes checked: Female, Youth, Minority. Now the question will be, knowing that will she continue to go boldly where no socialist has gone before, or will she tuck it in after her CTJ meeting with Pelosi and the Rat leasership? There are a lot of 3-box Rats in Congress who have aspirations of their own, and many others who have one or two boxes checked and who have been working to build support and doing the crap-work needed to advance to leadership positions. They aren’t going to take kindly to this upstart jumping the line. And they might point out that “smart” SHOULD be a factor, and she isn’t. Let's Wrap This FReepathon Up, Folks! I've little doubt that you're right. LOL! In my opinion, we should preferentially be attacking her ideology and proposals, not her personally. It just makes her a cult figure with the left. If people wanted to pay higher taxes they could have all those things. If there was some way to divide the population into two halves, one wanting to pay more or receive more, the other content with status quo or better, then it would not be coercive (although ridiculously expensive for the half who do want to pay, because in that half, about a third would not be paying anything). I worked out that America could have free health care if there was a 3% surtax on gasoline. So with that in mind, you could have pumps where you pay the current price, and pumps where you pay 6% extra and the extra goes to health care. I’m thinking if you were in a hurry, those 6% surcharge pumps would be pretty quiet. This is not a policy suggestion, just an illustration of how socialized medicine actually works in economic terms. I don’t think it would be sustainable to have two different systems anyway (obviously the status quo people would need to go to different health care facilities than the free service people, in some cases anyway). We don’t have free medical care in Canada if you hear Democrats saying that we do, in some provinces we pay directly and in some others there is a payroll tax which probably means that workers earn less than they otherwise might (and goods and services cost more). But there’s no such thing really as free government services, somewhere, somebody pays for it in their taxes. That tag line is now corrected ... and it only took five seconds. Actually, she said the “three CHAMBERS of government”. Incredibly ignorant. Interestingly, that is a large part of President Trump's support among the people: self-serving special interests in Washington (i.e. The Swamp) should be disrupted. I expect Occluded-Cortex to become part of that same swamp pretty early - probably by January 10. At least the horse is useful.